Alanda June 14, 2017 2 Comments This post may contain affiliate links. It’s just like Christmas here at Alanda Craft. We recently purchased a Brother Dream Machine 2 from Echidna Sewing in Queenland. 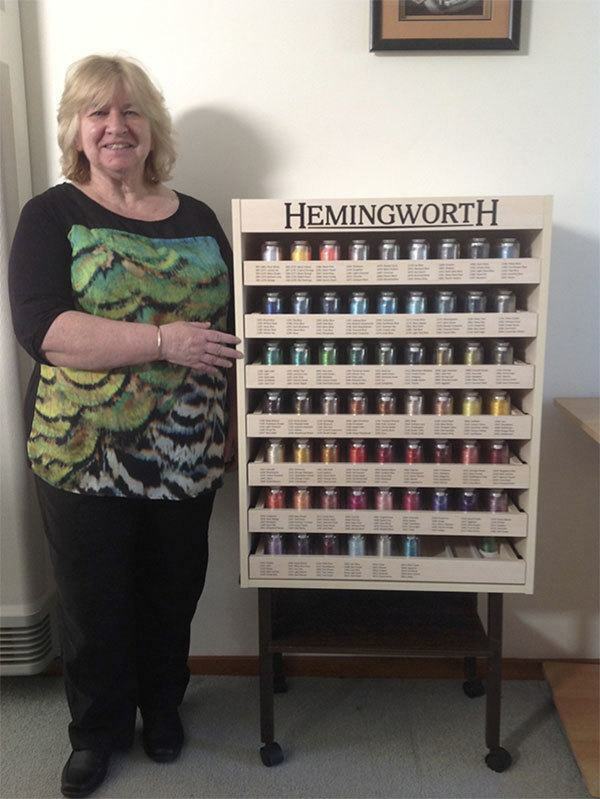 The machine itself is still in transit, however, as part of the fantastic deal that we received from Gary at Echidna, we also received a Hemingworth Embroidery Thread Cabinet with 300 spools of thread included. For those of you living in Australia, we recommend Echidna Sewing if you are looking for a great deal on sewing and embroidery machines. We purchased our Brother ScanNCut 2 from them and Gary and the ladies are always friendly and helpful. Well the cabinet and thread arrived today. So Paula got busy with the tools and put the cabinet together. Then we set about adding the 300 spools of thread to the cabinet. Fortunately, the cabinet comes with a decal display with the thread numbers that goes on the front of each drawer. So you can see instantly where your threads are located in the cabinet. It actually holds up to 315 spools of Hemingworth thread, so once you have all 300 spools, there is still room left to store 15 extra spools. 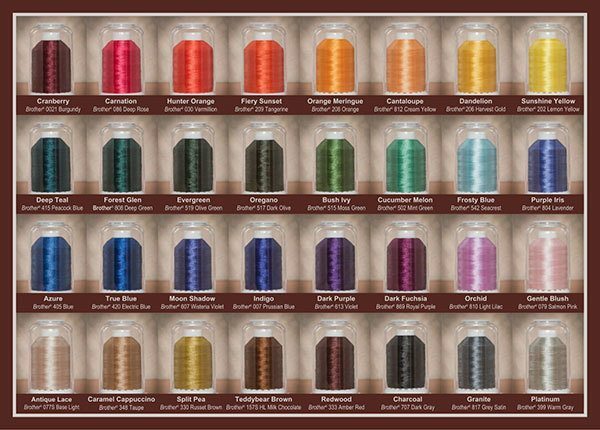 Really handy for when those threads you use a lot and so want to keep a couple of extras on hand. Or you can also store other brands of thread that you may have on hand. The drawers hold any thread spool with a 2″ base or smaller. The cabinet has 7 drawers that slide out easily on the metal runners, and each drawer holds 9 spools across and 5 spools deep. It is an attractive, stand alone piece of furniture that has a white maple laminate finish. You can also mount it on the wall if you so desire. All the hardware to do this is included. If you do lots of embroidery and feel the need to have more than one cabinet, you can stack them one on top of the other. 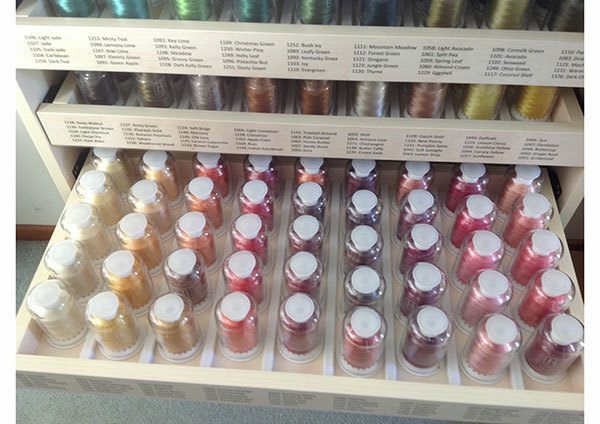 We are so loving this cabinet and having all those 300 spools of threads is just amazing. Hemingworth Thread is a 40 wt, 1000 metre polyselect embroidery thread. 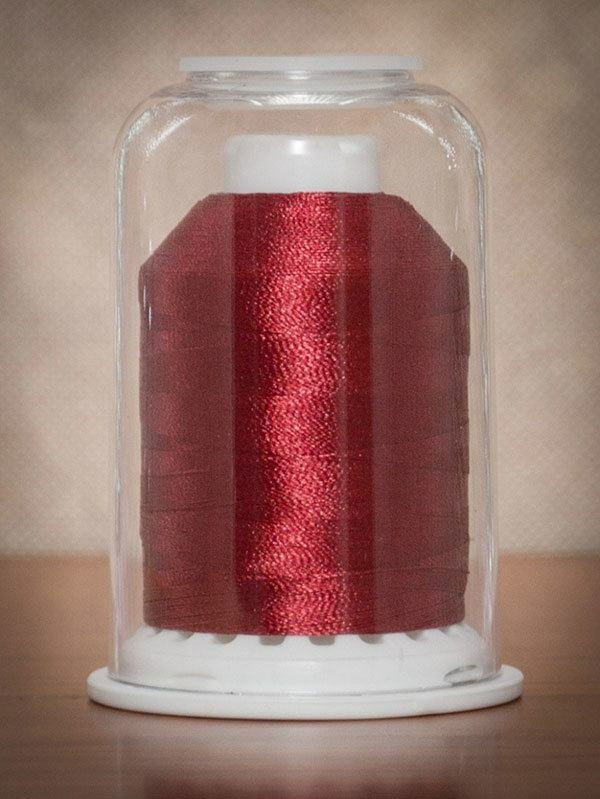 The thread comes in a holder that has this really neat spool and cap system that both protects the thread from dust and preserves the thread quality. The thread is soft and supple and another really important feature is that it is colourfast. We wondered how on earth we were going to match up our Hemingworth threads to the colours in our Brother Embroidery Machine, but fortunately for us Hemingworth have matched 96 of the Brother Colour Palette. 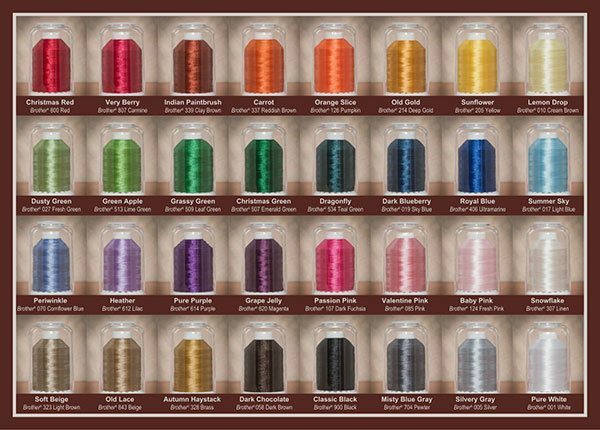 You can buy the Brother matched thread individually as well as in sets of 32 spools or in a set of 64 of the most popular Brother colours. 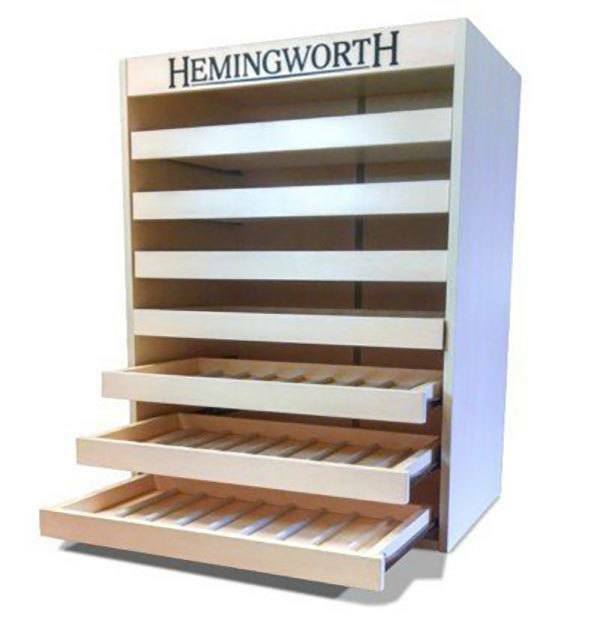 For our US readers the empty cabinet is available from Amazon and once you have it you can start to store all your lovely Hemingworth threads. Is the 300 spool cabinet available for purchase anywhere? Amazon does not have any and said they have no idea when they may have them back in stock.